Mahatma Gandhi’s birthday celebration has reduced to mere efforts to monetize . Mont Blanc has launched 241 limited edition 18k gold plated $24,763/ each pens. 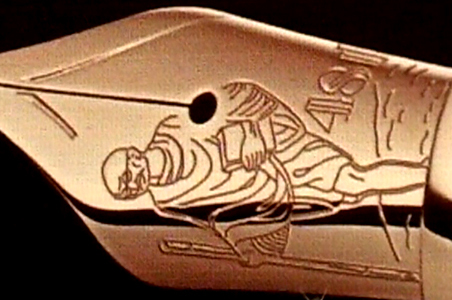 The pen is engraved with Gandhi’s image and tricked out with a saffron-colored mandarin garnet on the clip and a rhodium-plated nib. A billboard put up this week over Mumbai’s teeming slums shows a gaunt Gandhi next to an image of the swanky pen, with golden threads woven around it to represent Gandhi’s spinning wheel. This one is oozing with irony! Gandhi who lived and preached life of minimalism, his name, today, is being used as a sales gimmick for the opulent and could-not-care-less types. Mont Blanc got it all wrong. 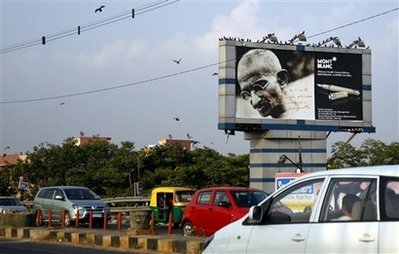 Traffic moves past a billboard displaying a portrait of Mohandas Gandhi, the ascetic father of India's independence, besides an image of a Montblanc pen in India. Internet search giant Google paid tribute to Mahatma Gandhi on Friday on the 140th anniversary of his birth, replacing the ‘G’ in its colorful logo with a picture of the Indian independence hero. Nice gesture. Well, Mahatma Gandhi now has an Iphone app of his own. Get all your favorite Mohandas Gandhi quotes all in one place. 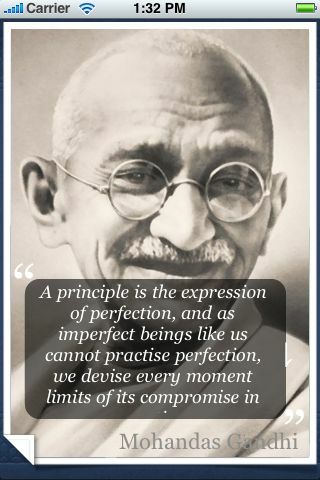 Pay homage to Gandhi’s intuition with the Mohandas Gandhi Quotes application. Every time you want to take a peek at one of Gandhi’s quotes, just shake your cell phone or tap the screen with two fingers. This app also gives you a chance to favorite the ones you like. Just wondering, if only Mahatma Gandhi knew of this viral technology, would he have said more or different. The recent discussion that followed the post on IIT encouraged me to put down my thoughts on Indian education system, not just IIT. Growing up we did not have the luxury of attending schools that were considered prestigious, nor did we have the pressure to perform in entrance exam. My mother one day dressed me up in a shirt reserved only for visits from important relatives, and told me we were going to school. I had no idea what a school was: I was too young and the word school was not part of my vocabulary. But I realized it was something important to my mother, otherwise she would not take out that shirt. Growing up we did not have much, but that did not stop us from being happy. Childhood is the best season of Indian life. Back then extended neighborhoods were still the norm: our front yards mingled with each other unaware of fences or formalities. We walked in any house without invitation; we got scolding from any parents without inhibition. We were fed, watched, and disciplined by all. We were the neighborhood kids, all twenty there of us. I grew up with middle class morality – and mentality. You know the kind that teaches you to be honest and hard working so that you can get a clerical job at a corrupt business. The rallying cry was striving for mediocrity. Not excellence, not even success. Do not be so full of yourself. Have some modesty. Yes that kind where mediocrity is always protected under the veil of modesty. No one ever told in the collective face of Indian middle class: “Don’t be modest, you are not that great.” So we kept struggling to survive. We middle class marveled at our mundane mediocrity. “Are you Indian?” It is a common question for Indians in a foreign land. I am told. They may be attending a two day conference in Singapore, or on a weeklong package tour in Malaysia, or on semiannual visit to their children in America, or born and lived their entire life in London or Johannesburg. It does not seem to matter. The question is always the same. It meets with a definite yes. “Why you spend so much money on hay?” I once asked Ramu uncle. He was busy feeding the cows in his backyard. His overworked body was scarred but strong. He had no time for a pesky boy. I asked again.